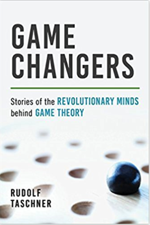 In Game changers Rudolf Taschner presents a satisfying, accessible, and wide-reaching account of the people and ideas behind game theory. The book is organised around anecdotes and conversations that surround key events in game theory's development. Most of the conversations are fabricated — Taschner says so himself in the introduction — yet, if we are to believe Taschner (and we have good reason to, given his extensive contributions to mathematics outreach), they remain faithful to the mathematicians' characters and the substance of their thought. The result is a an engaging collection of quasi-historical snapshots that leave the reader with an understanding of what game theory is, how it came to be, and why it matters. Despite frequent chronological and geographic jumps, Taschner succeeds in presenting a narrative with a clear arc. The early pages are dominated by the notion that game theory is a mere amusement. But gradually, the reader realises that game theory lies at the heart of trade and commerce, of human interaction, and of existence itself. Certain mathematicians return at various points in the story: Pascal, for example, is presented as a sort of mysterious sage who, every few chapters, provides relief and perspective to contrast with the feverish toil displayed by nearly all of the other characters. This gives a sense of continuity, and demonstrates how the development of game theory was itself a game, played between some of the greatest minds of the last centuries. While the content of the book is compelling and the overall structure is conducive to communicating the author's main ideas, the book suffers stylistically. This may be due in part to the translation (the book is originally in German), leading to too-frequent awkward sentence structures that distract from the overall flow. Some anecdotes subject the reader to lengthy forced dialogue, so that the main thread is lost. At other times, tenuous allusions are made that serve more to show off the narrator's cosmopolitan knowledge than to elucidate a key idea. The narrator also has a tendency to make sweeping claims that can be jarring in their generality and scope, as in the third chapter, when the narrator declares Einstein "completely wrong" in one of his assertions — which ironically aligns Taschner with a line of physicists he has just criticised for making similarly grand (and false) statements. Overall, however, Game changers is a valuable contribution to mathematical outreach and the public understanding of game theory. Diagrams are included helpfully throughout, and the final pages set forth ten number games for the reader that echo topics discussed in earlier chapters. Nearly everyone will find something of value in this book, whether it be mathematical insight, historical perspective, or a better understanding of the key personalities behind the development of game theory. In sum, Taschner's newest book is a bet worth taking. Stephen Kissler is a research fellow in applied mathematics at Queens' College, University of Cambridge. He studies mathematical biology, focusing on how infectious diseases spread.